Think fairy tale characters. Think classic romance storyline. Think big musical numbers. Mash them up, and you have Shrek the musical. Based on the Dreamworks animated film, Shrek the Musical (written by David Lindsay-Abaire and Jeanine Tesori) is a mish-mash of all fairytales put into one. Joining the improbable hero Shrek and his trusty and sassy Donkey as they undertake the quest to rescue the beautiful and slightly bipolar Princess Fiona from the tall tower guarded by a love-seeking, fire-breathing dragon! 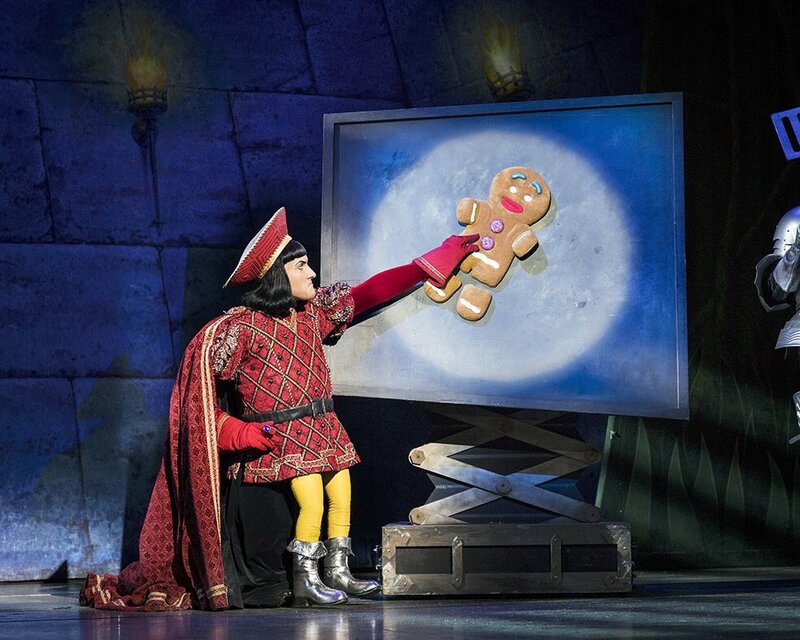 With the pocket-sized Lord Farquaad, a group of exiled fairytale characters and musical theatre references by the dozen, you’ve got yourself a comedy musical! After an unbeaten run in the West End, the tour held high expectations. Sadly though, some of these were not met. A creative decision to cut and change some of the songs was a wrong choice, as the songs and scenes sounded choppy. The fact that the classic, sassy Donkey Pot Pie was changed for a less dramatic song lost the control the dragon has over Donkey. 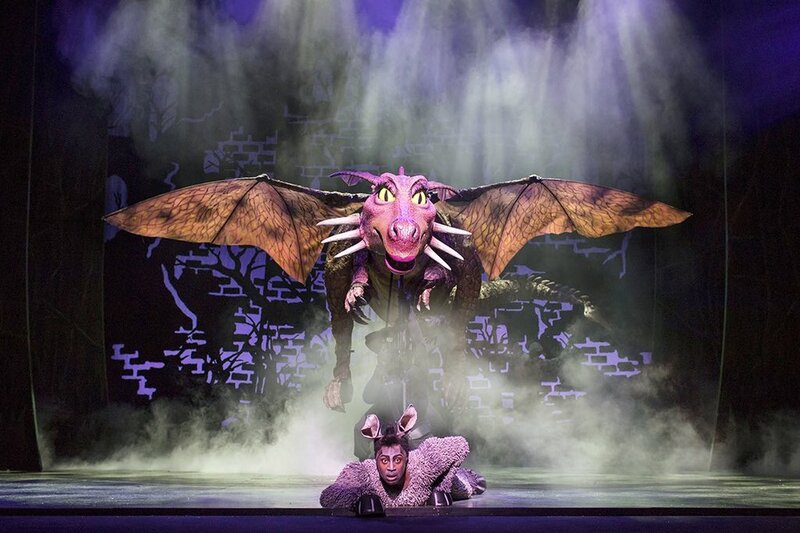 The opening was weaker than in previous productions, with the characters just popping their head out of a giant storybook while projections add the background and story element. Stepping up to the icon, Scottish ogre was Steffan Harri, but sadly he played the character a bit too soft and friendly. Rather than making a real impact in the beginning as a scary character who does not feel that much, to then see the development as he learns to love and welcome new friendships – unfortunately by being a bit too soft in the beginning we didn’t see this dramatic change. Harri wowed the audience in Who I’d Be, showcasing his incredible vocal talent. The moment when the show really got a lift was when Marcus Ayton bounded in as the lovable Donkey, showing his groove in an abridged version of Don’t Let Me Go. Princess Fiona was comically played by Laura Main, but sometimes forcing some “funny moments”, when she should have just let them flow and naturally got the laughs. Once again a creative choice to cut the Young and Middle Fiona in I Know It’s Today and replace them with puppets was one that needs to be rethought, as it didn’t really show how temperamental Fiona can be. Stealing the show in his key numbers and scenes was Samuel Holmes’ tremendous and sarcastic role of Lord Farquaad. Great things come in small packages, and Holmes manages to steal the show at only three foot tall. The ensemble never stops, and sometimes this showed – sadly it was in one of the first ensemble songs, Story of my Life, that was a bit under energised and lacklustre. In act two, the cast really upped their game and brought the house down with Freak Flag. A flamboyant and sassy production with some great characters, leaving the audience cheering with glee and dancing in their seats. 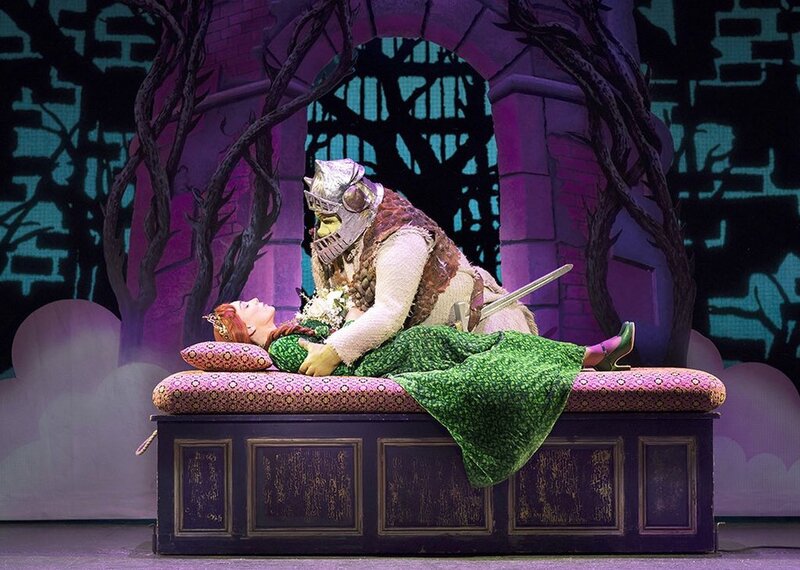 Shrek the Musical is playing at Manchester’s Palace Theatre until 28th January – book here.